evidently this rule is a quotation from the great maker of rules. I also like the non-parallel demands of "Enforce No Climbing" and "No Running" (I guess it's not enforced). Thanks, Apryl. Is that supposed to be a list of the parents' responsibilities? 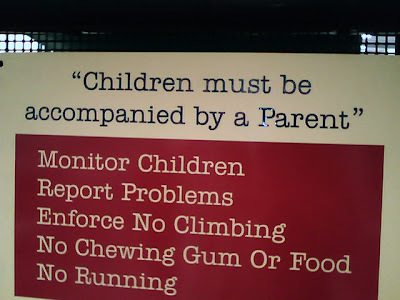 So, the parents aren't allowed to run, even if children are climbing? I read "Enforce No Climbing" as meaning "Do not enforce any climbing". That makes it more congruent with the other demands. Well if they can't chew gum or food, what ARE they allowed to chew? I hope they teach the Heimlich Maneuver there! Good slogan for a playground. Very succinct AND authoritarian. Jeff, I have begun to believe that you hate children. As for me, I try to MAKE my children chew their food. I don't think "no chewing" needs to be a rule since I can't get my bunch to slow down enough to make such a rule necessary. and to think my parents encouraged food-chewing. i must say it is hard to get a hamburger down whole, but rules are rules.